Early days of the Hokulea, 1975. At least a thousand people sat silent on the beach yesterday, watching a Polynesian canoe-blessing ritual not seen since the days of Kamehameha. Then with hoots and hollers from the crowd, a hundred hands tugged on the lines to send a spanking-new double-hulled canoe down the ways and into Kaneohe Bay. After some two years of dreaming, the Polynesian Voyaging Society was afloat. The place is Kaneohe Bay; the date, 1975. But not since the days of Kamehameha has such a Polynesian canoe-blessing ritual been seen in Hawaii. The occasion was yesterday’s launching of a double-hulled craft which the Polynesian Voyaging Society will attempt to sail to Tahiti and back next summer. For more pictures and the story, see Hawaii Report on Page A-3. Sunday Star-Bulletin and Advertiser, Page A1, March 9, 1975. Greeted by a blessing of light showers, flowers, music, dance and many hugs and kisses, the crew members of the Hokuleʻa returned from Tahiti at 1:00 p.m. on June 6. After 25 days at sea the crew slowly made its way through the crowd to a stage at Magic Island where the Royal Hawaiian Band, Leinaala Heine Kalama’s hula halau, and a musical group with the same name as the double-hulled canoe. Hokuleʻa, performed as part of the welcoming ceremony. Nainoa Thompson, the navigator, became the first Hawaiian to navigate by using the stars and currents in at least 200 years. The preciseness of his course has been heralded by many as a modern navigational triumph. Mayor Fasi said the voyage illustrated that: “The people of Hawaiian ancestry in Hawaii…can show the determination to get any job done that they set their hearts on. This marked the second successful completion of a round trip voyage to Tahiti. The first voyage to Tahiti in 1976 was navigated by Mau Piailug, a celestial navigator from Satawal in Micronesia. The return trip to Hawaii was completed using modern navigational equipment and methods. 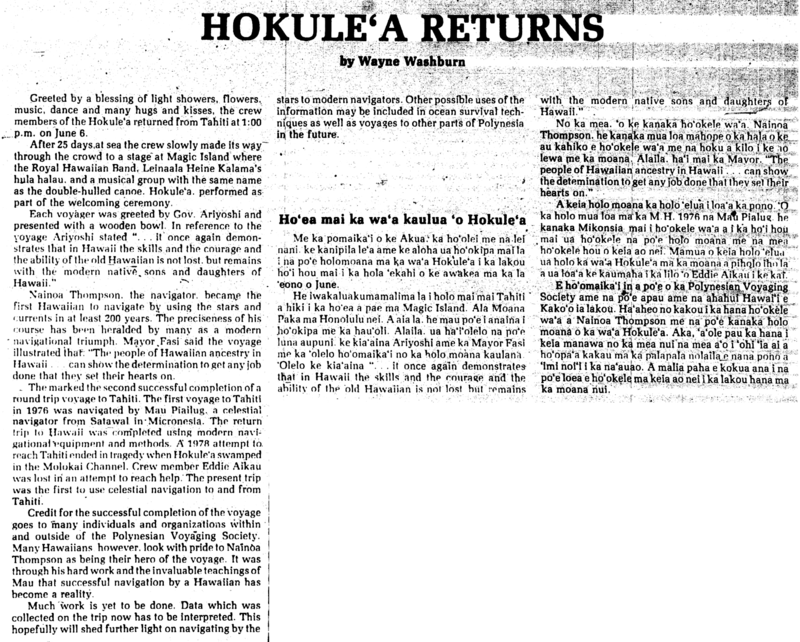 A 1978 attempt to reach Tahiti ended in tragedy when Hokuleʻa swamped in the Molokai Channel. Crew member Eddie Aikau was lost in an attempt to reach help. The present trip was the first to use celestial navigation to and from Tahiti. Credit for the successful completion of the voyage goes to many individuals and organizations within and outside of the Polynesian Voyaging Society. Many Hawaiians however, look with pride to Nainoa Thompson as being their hero through his hard work and the invaluable teachings of Mau that successful navigation by a Hawaiian has become a reality. Much work is yet to be done. Data which was collected on the trip now has to be interpreted. This hopefully will shed further light on navigating by the stars to modern navigators. Other possible uses of the information may be included in ocean survival techniques as well as voyages to other parts of Polynesia in the future. Me ka pōmaikaʻi o ke Akua ka hoʻolei me nā lei nani ke kanipila leʻa a me ke aloha ua hoʻokipa maila i na poʻe holomoana ma ka waʻa Hōkūleʻa i kā lākou hoʻi hou mai i ka hola ʻekahi o ke awakea ma ka lā ʻeono o June. A kēia holo moana ka holo ʻelua i loaʻa ka pono. ʻO ka holo mua loa ma ka M. H. 1976 na Mau Pialug, he kanaka Maikonia mai i hoike mai i hoʻokele waʻa a i ka hoʻi hou mai ua hoʻokele nā poʻe holo moana me nā mea hoʻokele hou o kēia ao nei. Ma mua o kēia holo ʻelua ua holo ka waʻa Hōkūleʻa ma ka moana a piholo ihola a ua loaʻa ke kaumaha i ka lilo ʻo Eddie Aikau i ke kai. E hoʻomaikaʻi i nā poʻe o ka Polynesian Voyaging Society a me nā poʻe a pau a me na ʻahahui Hawaiʻi e kākoʻo iā lākou. Haʻaheo nō kākou i ka hana hoʻokele waʻa a Nāinoa Thompson me nā poʻe kānaka holo moana o ka waʻa Hōkūleʻa. Akā, ʻaʻole pau ka hana i kēia manawa no ka mea nui nā mea aʻo i ʻohi ʻia ai a hoʻopaʻa kākau ma ka palapala no laila e nānā pono a ʻimi noiʻi i ka naʻauao. A malia paha e kokua ana i nā poʻe loea e hoʻokele ma kēia ao nei i kā lākou hana ma ka moana nui. Ke Alahou, Helu 6 & 7, Aoao 7. May-June 1980. Polynesian Voyaging Society—News from today, 2012. Check out the Polynesian Voyaging Society’s new website!